Two weeks ago I was in New York, where I had a small whirlwind of eating, drinking and shopping. In this post I describe some of the places that I visited. If you love desserts and are heading to New York, check out some of my other posts. See a slide show of my New York 2006 Dessert Adventures! I think the Doughnut Plant served the best donuts I have ever eaten. The storefront for this shop is simple and utilitarian. Their focus is to make the finest doughnuts they can with the highest quality ingredients. Based on my sample, their doughnuts are light, moist and extremely flavourful. Their selection included: Valrhona chocolate, banana pecan, grapefruit, chocolate crumble, cranberry, pannetone, tres de leche and vanilla bean. Being overwhelmed by the choice, I asked for help from my friendly server, who suggested the cranberry doughnut. Based on appearance, I was skeptical of this choice because the donut was glazed in pink and covered in tiny red specks. Nonetheless I bravely took his advice. It was so delicious that I immediately had to try another. I chose the tres de leche. I had one bite and was in heaven. I found it even better than the first. That was it: I had fallen in love with the Doughnut Plant. If you like doughnuts, or just have a sweet tooth, the Doughnut Plant will probably win your heart too. Lady M is a classy salon on the Upper East Side that has a lovely selection of desserts. Their display case is filled with classic cakes that sound, look and taste exactly as you would imagine. Their cakes include: Lady M Mille Crepes, Miroir Caramel, Gateaux aux Marrons, Gateaux aux Chocolate, Gateaux aux Fromage Blanc, Mille Feuille, Gateaux Citron, Montague de Fraise, Tarte aux Fruits and Le Gateaux New Yorkais. I tried their Lady M Mille Crepes Cake, which I was told was a favourite. 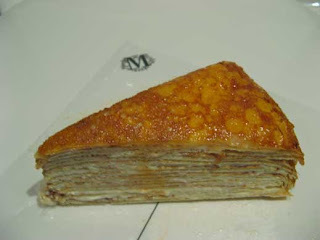 It is composed of perfectly shaped, light-as-air, crepes that are sandwiched between thin layers of cream custard. The cake has a hint of cherry liquor and a caramelized top. It was amazing. Although you’ll pay a bit more, I suggest you go to Lady M for a slice of high quality cake. Desserts this satisfying can be hard to come by. Tavalon Tea Bar is a fairly new teashop near Union and 14th Street that offers a variety of premium loose leaf teas, including green, white, black and chai. They also sell a selection of teapots, tea gift sets and tea accessories. Tavalon offers hip and stylish hot and cool drinks, like the Healthy Buzz, Detox, Chai Seduction, Genius, Herbal Oasis, Tropical Peony, and After Dark. During my visit I sampled a number of flavours and bought a canister of After Dark, which is a blend of herbs, such as chamomile, and tangy exotic fruits that smells absolutely spectacular. I also purchased green tea cookies that Tavalon sources from Amai Tea and Bake House. Some of you might be familiar with Amai Tea and Bake House: It’s run by the lovely Kelli of the blog Lovescool. 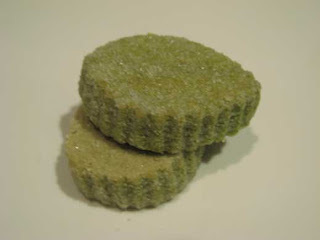 I have made green tea cookies, but they we certainly not as good as Kelli’s. Tavalon is a cute and stylish tea store and worth a visit if you are interested in quality teas. Balthazar Bakery is a small and busy shop that you can count on for a small and lovely selection of baked goods. Many loyal New Yorkers frequent Balthazar for their morning coffee and snack. Their display cases are filled with croissants, Danishes, scones, cookies, breads, tarts and miscellaneous small snacks. I had a wonderful pear tart, which had pears poached in red wine arranged on light puff pastry. It was one of the finest pear tarts that I have had in a while. Balthazar has delicious and reliable baked goods. It would be wrong to write about desserts in New York without mentioning Francois Payard . If you have never visited Payard’s Patisserie and Bistro, I suggest you go. Payard is undoubtedly one of New York’s most well known pastry chefs. His pastries and desserts are beautiful, elegant and delicious. Upon entering Payard’s, you will see marvelous display cases lined with tarts, cakes, mousse cakes, petit fours, cookies and chocolates. If you have a sweet tooth, are a pastry chef or just love beautiful desserts, I recommend dropping by and picking up some lovely pastries to go. Since I will not have a chance to head back to New York this year, I have decided to end my series of posts on sweets in New York. I have had a wonderful time discovering, eating, drinking and sharing my experiences. Thank you to all the sweet friends who accompanied me on these excursions, as well as to all the amazing people on-line who recommended places to try. Also, a big thanks to everyone who has continued to read and support my blog. Cheers, Sam! Posted by Sam at 11:16 p.m. Thank you so much for this sweet trip to New York. I have enjoyed each installment and hope to make it to NY city one day, now that I have a great guide! Ah, so there's an actual Doughnut Plant in New York City! I tried a Valrhona in Tokyo. I'm glad that you enjoyed the posts! Thanks for you comments and I hope you get a chance to make it to NYC as well. That Valrhona doughnut looks awesome! I heart the Doughtnut Plant! Thanks for reading my posts. Some of these places were really amazing! I also wanted to let you know that I really enjoy your blog. 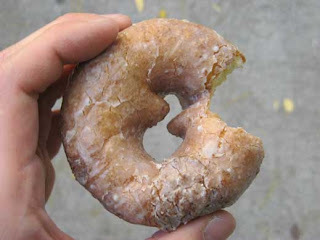 I remember all the doughnuts from the Doughnut Plant being square shaped. Is it just the filled ones?